I moderated a SLA Legal Divisionsponsored CE at the SLA Conference (currently happening in Seattle) called “What Do You Do After You Log Off” presented by Mary Ellen Bates, consultant and author of Library of Fortune. Mary Ellen’s presentations are always thought provoking and extremely useful at the same time. I’ve never come away from any of them without learning about important research tools and tips. This program was no different. Without trying to cover the 4 hour program, I thought I would highlight some of the ideas and resources she talked about for use in packaging and delivering information as well as sources for producing statistics that go beyond what we have traditionally delivered to our library users. “The perfect is the enemy of the good enough” – Here Mary Ellen talked about the need we all have as librarians to provide the perfect answer while the reality is that we may not have those types of expectations from our users and we most often don’t have the time to do it either. 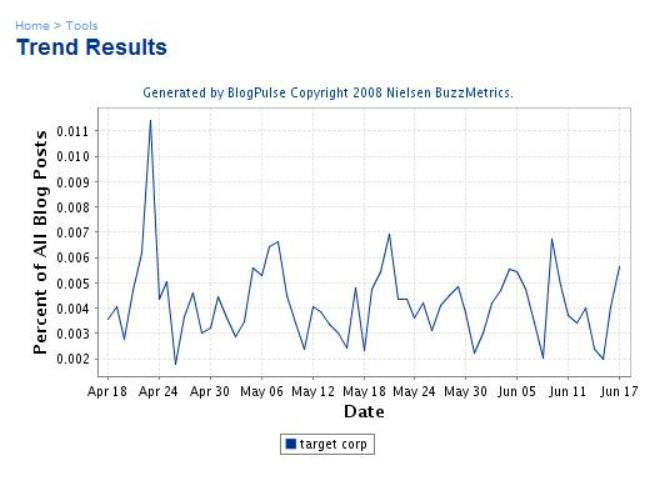 BlogPulse.com – This is a tool for creating trend results of subjects that have been written about in blogs over time. You can search on a topic or the name of your company, firm, client, prospect, etc. and see the trend results for the last 2, 4, or six months in a chart format. It has other features to check out as well. 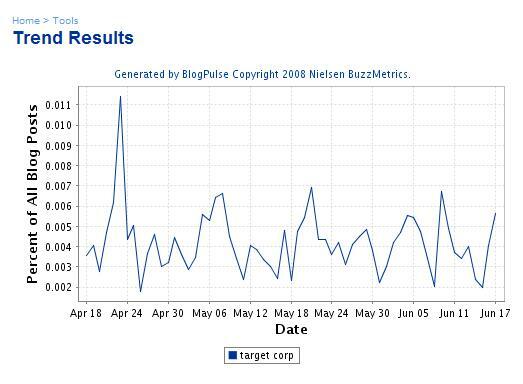 Click on the following image to see the amount of times Target Corp was blogged about during the last 2 months. 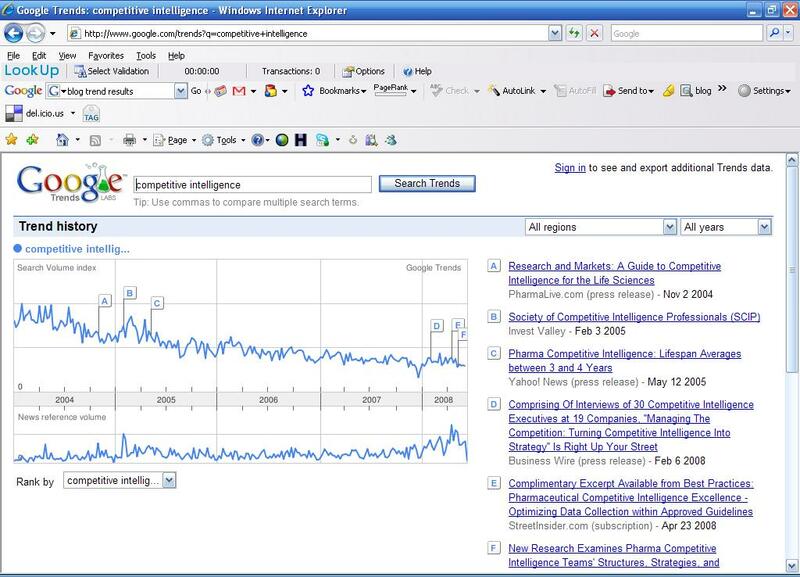 Google Trends– This trend analysis tool will tell you what people are searching on over time. You can also compare search terms over time as well. This goes back farther than BlogPulse. You can search for trends in searching from January 2004. You can also limit by region/country or by year. Here again you could use this to search topics, companies, industries, etc. Click on the following screen-shot to see the trends for “competitive intelligence” shown with a chart and the top 10 in regions, cities and languages. Furl.net – This is a social networking site that has tons of features. Mary Ellen demonstrated it as a tool that you can use to save urls for resources that you discovered while researching a topic. Once saved, you can share with others, produce a citation list, etc. No more copy and pasting into a report to send to your client. I haven’t had time to explore it myself, but it looks like a great resource for managing and delivering research results worth sharing. This is only a minuscule part of what Mary Ellen presented. Definitely 4 hours that were worth it. As she does repeat this program at various venues, I would recommend attendance you you have a chance. Categories: Competitive Intelligence, Packaging Research, Research | Permalink.